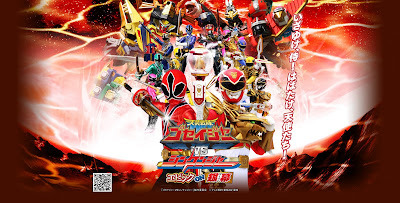 Goseiger vs Shinkenger Now Available! The rental version of the latest Super Sentai VS movie, Tensou Sentai Goseiger vs Shinkenger: Epic on Ginmaku is now available for stream and download! The movie debuts at #3 in Japan Box Office last January. So, Takeru gave an order to Jii to call back all the other Shinkengers. Arata, as a Goseiger, wants to co-operate with the Shinkengers. Jii thinks that Doukoku has something to do with Gedoushu's return. The other four Shinkengers reappear one by one, but it wasn't the time for a celebration. Madakodama once again starts attacking and 2 Super Sentai teams teamed up to fight him. But it was such a difficult fight for them, that Takeru was captured. this made an uproar to occur between the 2 teams, although Arata refuse to give up. Something awful is happening to Takeru's body. What is his fate? Can anybody Sub this? or any Fansub ? @luke wait for a while, quite sure T-N will do they best to sub this. so, everyone can upload any toei video into youtube if they make it link only? Where can i find the link for go-onger vs shinkenger movie? They gonna need time for this.